"Orc blood is salty and sour." Kursk grew up among an orc tribe known as the Bloodseekers. His father was Kronk, a raid leader. Kursk remembers very little of his mother, a human captured by orcs in a raid. She died when he was very young. His tribe had several half-orcs, as raiding human settlements and taking female slaves was common practice. He learned the brutal fighting techniques of the orcs and participated in many raids. He was also a highly skilled archer. His tribe the Bloodseekers got in a conflict with a goblin tribe the Deathwalkers. Most of his tribe, including his father, were slaughtered. Kursk was spared and became a slave of the goblins. 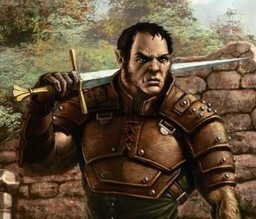 Years later he was rescued from his enslavement by a party of dwarves and human rangers who found him and other captives in chains and released them. The released slaves were other half-orcs, humans, and half-elfs that the goblins had acquired over the years. This motley crew of former slaves wandered through Faerun and eventually splintered off into different groups. Kursk ended up with a band of mercenaries known as the Borderland Protectors. They were based out of Berdusk and Elturgard used them to patrol the borders north of Berdusk. The government of Elturgard became corrupted by outside forces and the Gauntlars – the military paladins of Elturgard – declared the Borderland Protectors as infidel outsiders. They were forced out of Elturgard. Kursk’s small band of Borderland Protectors was attacked by Gauntlars and slaughtered to the man – all except for Kursk, who managed to escape death because he was on patrol when his band was attacked. He heard the sound of battle and raced to join his band, but when he arrived he saw them all slain. He took refuge in a small cave until the Gauntlars left the area. Alone in the wilderness, he headed northeast to find a new home. He knew Eltugard would not be a safe haven anymore. He hoped to find work and a community that accepted his racial heritage.